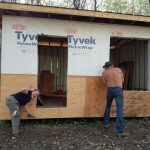 What a beautiful weekend for building a Tiny House and David and Sherry were busy building a tiny house on their country property. 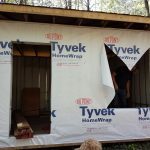 The Tyvek went on and some of the plywood. The progress is remarkable! This tiny house has been constructed with mostly reclaimed building supplies from our store, Home Re-use-ables. Stay tuned for further progress reports!